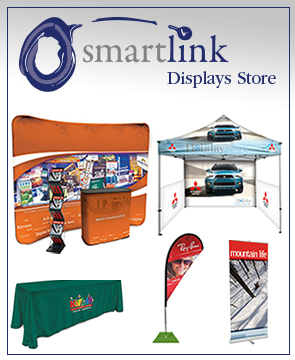 SmartLink prides itself in providing excellence in design, print, fabrication and event management services for our customers. Offering a full spectrum of capabilities allows us to manage our clients’ projects from design, approval, print production & finishing, through to fulfillment, distribution and installation. Simple or complex, large or small, our variable cost structure allow us to effectively manage a large variety of projects. SmartLink offers design services experience in corporate identity, packaging, print collateral, advertising, large format, tradeshow, display and more. SmartLink is dedicated to helping businesses obtain the high quality printing products and services they need at reasonable cost. We’re led by veterans of the printing industry and have built our business model with a variable cost structure. Whether you are looking at having banners hung in your retail locations, custom lettering installed behind your reception desk or have that fleet of vehicle wrapped, SmartLink is here to assist. SmartLink USA LLC is an Ohio based company that is controlled by FH Global Enterprises, LLC. We are dedicated to providing effective marketing services and efficient print and fulfillment at reasonable cost. Our team is made up of veterans of the event management, marketing and printing industries and we have built our business model with a variable cost structure. This allows us to offer a high level of practical experience, know-how, and a network of industry contacts, so clients save money and time. We leverage technology and geography to ensure the work gets done at the optimal price while retaining the highest quality. We are able to offer a full suite of services by leveraging the knowledge of professionals that can provide solutions for all services, paper, bindery, graphics, installation and fabrication at a reasonable cost. SmartLink and its partners leverage state of the art equipment and technology to provide outstanding results with reasonable costs. SmartLink works with a wide variety of print formats and unique substrates in order to pair the right printing process and material for your specific application. We have a demonstrated history of working with our customers to fully understand their requirements and ensure that the final product meets the defined needs.